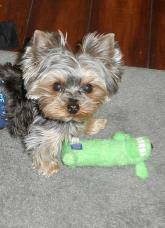 This is our adorable little "Teddy Bear"! 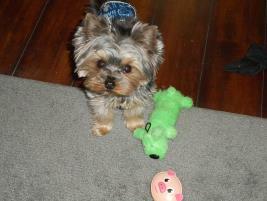 He is just barely 3 lbs and has the cutest little babydoll face and is such a loveable cuddler and is the daddy to our yorkie babies! 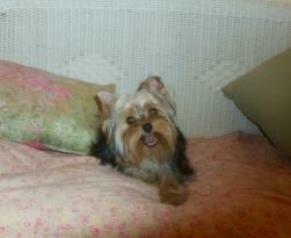 He is AKC and CKC registered from champion lines! He has an amazing coat but we keep him shaved because he's a typical boy and likes to run and play and doesn't go for all that daily froo froo grooming! 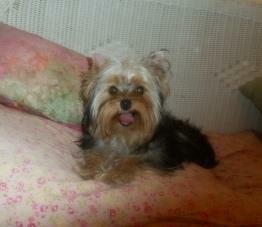 This is little "Chelsea"! She is so loveable and also has an adorable face. She is 5 lbs. and is a real sweetheart! 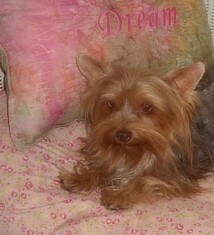 Her Mom is our Chocolate & Tan girl Mocha! Look for some adorable puppies from her soon! This is our beautiful girl "Mocha"! She is a rare chocolate & Tan. She also carries the parti gene. We got her as a puppy and she is a rich chocolate color. She is now retired and living the high life as a loving lap dog with a good friend of ours. I have always been one to try new and rare colors because I have always thought that Variety is the "Spice of Life". I raised Parti poodles when they were frowned on and now they are one of the most popular colors. So when I heard there were merle yorkies, I jumped on it as I have always been a sucker for Blue Eyes. So introducing our little "Freckles" a tiny 5 pounder with one partial blue eye! She is a beautiful rare blue merle. She carries the parti gene and hopefully she carries the chocolate gene like her mom too. She is only 5 lbs. and is such a Luvbug with the cutest face!. Hello everyone! 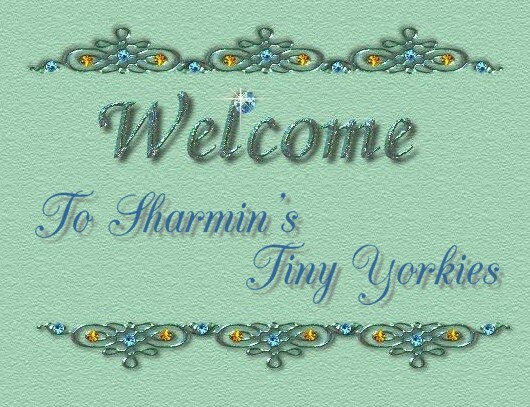 You might remember me from years ago, I went by the name of Sharmin's Toy poodles and specialized in the tiniest cutest Poodles with adorable babydoll faces for over 30 years. Some of my past babies reside with famous athletes and celebrities. But time marched on and I got older and I retired from breeding poodles. This worked for a few years, but my heart felt empty, and I just missed holding and cuddling my babies so much! 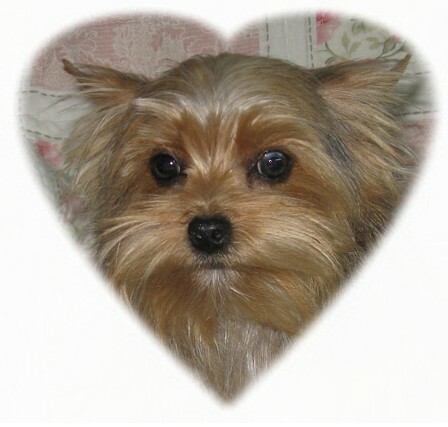 My Mom passed away and her dream had always been to own a yorkshire terrier. 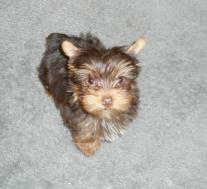 So I decided to buy my first Yorkie in her memory. And so began my start in yorkies. 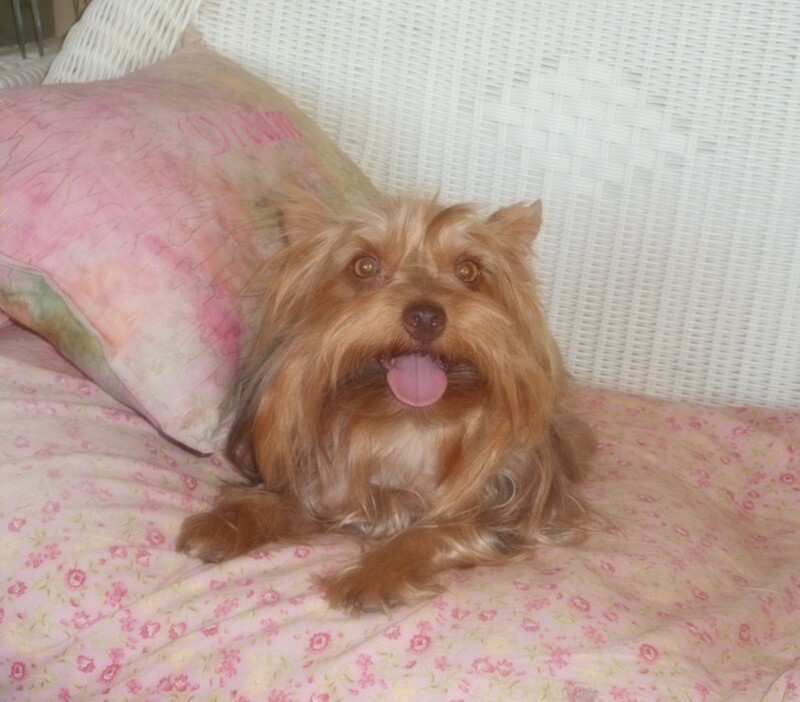 But now because of my health problems it is a hobby not a business and I only have a couple litters of yorkie puppies for sale a year. 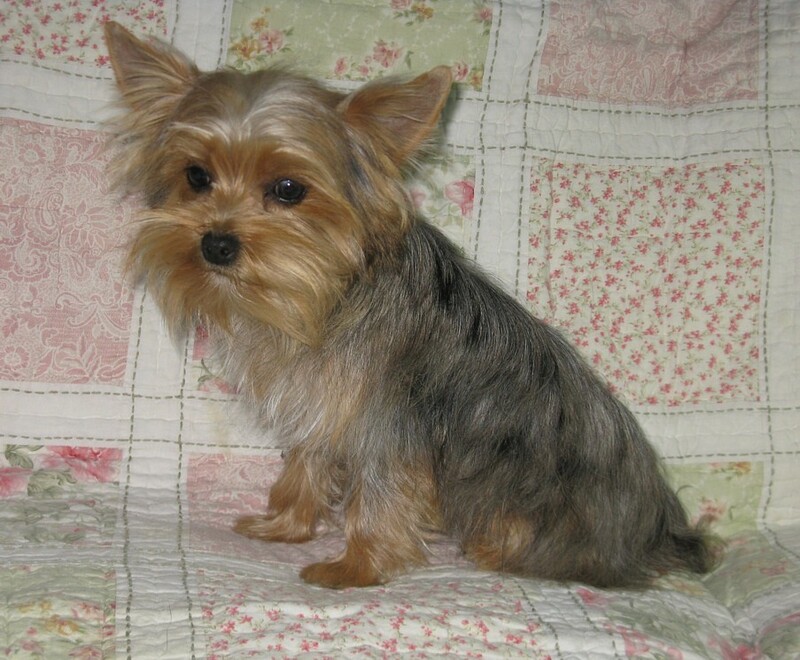 Since I can only have a few dogs, I decided to get the nicest, cutest small but healthy Yorkshire Terriers that I could find. And of course they all have to have that adorable babydoll face that makes them so darn irresistable! I have the traditional black/blue & gold and black/blue & tan and also have partis and merles occasionally. I stick to the yorkshire terrier standard of 4-7 lbs but I also get very tiny teacup yorkie pups for sale occasionally too! And of course all of our dogs and pups are members of the family and are raised at home underfoot with lots of Love! So check back and visit my Nursery Page to see what's coming up. I don't have pups very often, but they are true quality, well loved and are definately worth the wait!! Below are the babies parents! All pictures and printed data in this website are the exclusive right of Olynn's Orchards, Sharmin's pets, Sharmin's Toy poodles, Sharlyn creations and may not be altered, copied, distributed or otherwise used without our written consent. For more info you can contact: Lynda Burch at 760-927-7798 (any afternoon or evening to talk in person) or message me at any time. *NOTE: Merle colored dogs and their offspring are not eligible for AKC registration as they are not a recognized color. So they will come with other registration!